I received a lawyer’s letter, where I am instructed to delete my report about the Berlin head ophthalmologist Antonia Joussen and to pay her legal costs of over €2000, with more damage claims to come. It was the June 2nd report on my site “Research data integrity: words and deeds of Berlin’s head ophthalmologist which provoked this reaction. In brief, on behalf of Joussen the lawyer Johannes Eisenberg (who specialises in criminal law) denies band duplications, but acknowledges the criticised instances of gel splicing, while insisting this was an acceptable practice in academic publishing. He repeatedly refers to investigations by Joussen’s current employer the Berlin University Hospital Charité, who apparently exonerated Joussen just days (literally) after the concerns about her publications appeared on PubPeer in February 2015. On March 31st 2015 same Charité informed me that they decided not to declare their stand regarding Joussen’s criticised publications (evidence below). The Charité spokesperson instructed me to contact her previous employers, the universities of Cologne and Düsseldorf, who then refused sharing any information with me (in fact, the University of Düsseldorf research integrity ombudsman Ulrich Noack twice refused to reply to my emails). Now, Joussen’s lawyer abstains from naming which office or which “responsible employee” of the Charité had been performing these ultra-rapid investigations. Neither was any evidence or details of their image integrity analysis even mentioned. Joussen’s lawyer presents as proof of falseness of the PubPeer evidence (which he accuses me of having maliciously planted) this very Charité analysis as well as a certain internal, unpublished (and to me never disclosed) decision by the Dean of the University of Düsseldorf. This dean, though unnamed in the letter, is likely to be the dean of the Düsseldorf medical faculty Joachim Windolf, who allegedly decreed that no scientific misconduct in four of Joussen’s publications was found. The lawyer chose not to share this Düsseldorf decision document as well. Aside of two editorial communications, where gel splicing was self-admitted by Joussen, but apparently accepted as unproblematic by the Editor-in-Chief (EIC), no documents are provided in this regard to support the claims by Joussen’s lawyer. Most importantly, the lawyer makes no reference to the outcome of the 1.5 year-long investigation by the University of Cologne, which remains secret as I was not allowed to learn about it, despite my FOIA inquiry. Moreover, the lawyer makes a brief reference to a possible investigation by the DFG (German Research Society, a central public funding and investigative body), without informing me of its outcome. The entire lawyer’s letter (in German) is available here. The copyright for this letter lies entirely with Johannes Eisenberg, lawyer. Translation is mine, since I am not a professional translator, it is bound to contain mistakes. I will be happy to correct those when notified. My own replies in brackets, blue italic, labelled with –LS. Prof. Dr. Joussen has given you no reason to harass her for years [we exchanged only some polite inquiry emails in between February 2015 and April 2015, Joussen never complained of being bothered by me and even wished me “a blessed Easter”, -LS ], nor did she offer a reason to attack her scientific integrity based on false facts. However, Prof. Dr. Joussen does not deny that you are in principle allowed to assess her scientific and clinical work critically. Yet when you state fact-based criticisms, the facts must be correct. And if you do not know these, you must do research, when necessary, by making inquiries to the parties affected. I take it from your publication that you scrutinise in total 19 criticised publications. “After the editors were notified, and institutional investigation took place, only one paper was corrected, one received an editorial note of concern, others were seemingly forgotten”. I postulate: in the list of 19 publications, which you made the object of criticism, while presumably hidden yourself anonymously on PubPeer [I demand to see the evidence for this insolent accusation, –LS], there are 5 Corrigenda which have been published and in one case a Note of concern. Not a single criticism of the publication was “forgotten”. The anonymous “criticisms” on PubPeer were reported to appropriate offices of the Charité, as well as Universities of Düsseldorf, Cologne and Harvard, immediately after these “incriminations” became known. They were also reported to the DFG, in appropriate cases also the “Editor-in-Chief” of the affected journals was notified. In many cases it was established that the anonymous accusations on PubPeer were unfounded. The Heinrich-Heine-University of Düsseldorf has examined 4 publications and decreed on 10.06.2015 that there was no research misconduct. A number of publications were examined by the appropriate office of the Charité, and found that the accusations were raised unjustly [Please refer to my original article and evidence below to see that the Charité refused to comment on 16 of 19 criticised Joussen publications, while confirming image duplications in one (Semkova et al 2006) and establishing that another was an intentional double-publication by Joussen’s former Chinese employee, who also accepted full responsibility. The 3rd paper (Cai et al 2012) was referred by Charité to the responsibility of Joussen’s collaborator and corresponding author, Michael Boulton of University of Florida]. “Precariously, in two cases image integrity suspicions were neglected where Joussen was not only responsible as the key author, but also as the Editor-in-Chief (EIC) of the journal where these papers were published”. This is false. The papers in question were published before my client became EIC of Graef’s Archive [it’s Graefe’s Archive for Clinical and Experimental Ophthalmology, -LS]. Also, all publications authored by a EIC are processed by the Co-EIC, in the case of Prof. Dr. Joussen by Prof. David Wong. My client never supervised her own publications [which I never claimed, but every EiC is traditionally responsible for the publications in own journals, including ensuring investigations into data integrity concerns, -LS]. 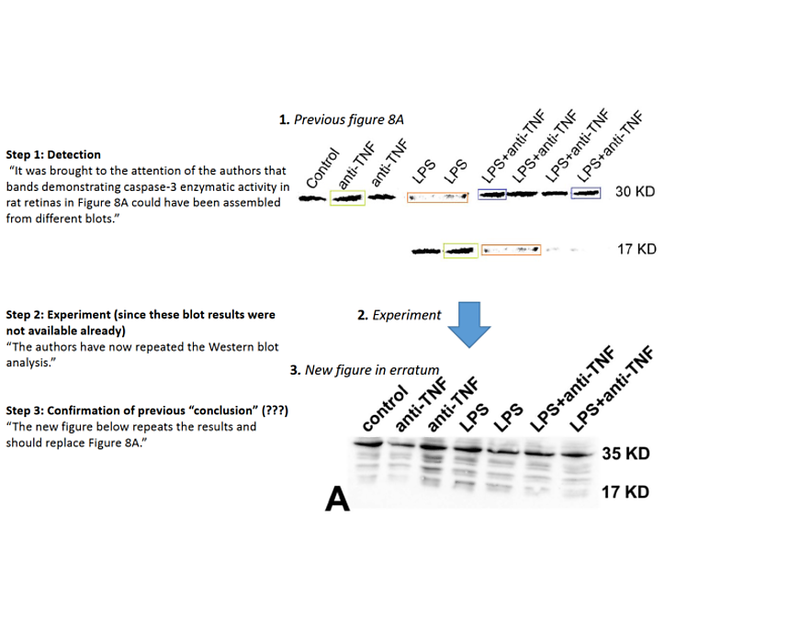 “Some western blot bands seem very similar, which prompted PubPeer commenters to suspect band duplication and intentional image manipulation, like in Joussen et al, 2009. The responsible EiC of the journal Molecular Vision was notified by me of these irregularities in February 2015, yet apparently saw no reason to act”. The responsible employees of the Charité found that there were no band duplications in this work [again, I insert the image in question below and humbly ask to see this report, including their methodology, -LS]. Document provided by lawyer in his letter to me, here Joussen writes to an understanding editor of Mol Vision “it was brought to our attention that the control band in figure 6A in our publication […] could have been added to the blot at a later stage. Neither of the authors hast noted this. We sincerely regret this error that escaped our attention during the 2 year revision process of this paper. As the original blot from 2002 is not available with the author that performed this, we have repeated the experiment. The new data demonstrated an identical pattern”. Editor’s reply: “We are satisfied with your explanation. We do not feel that anything else needs to be done”. Document provided by lawyer in his letter to me. The Erratum proof reads: “it was brought to the attention of authors that bands demonstrating caspase-3 enzymatic activity in rat retinas in Figure 8A could have been assembled from different blots. the authors have now repeated the Western blot analysis”. You are therefore to blame of not having inquired with my client, she would have told you about this. PubPeer criticism of the Erratum from 28.06.2016. The ratios of caspase-3 protein do not appear same when original and corrected western blots are compared (both for 30/35kD and 17kD bands). “Sometimes seemingly entire images (Semkova et al, 2010) got duplicated, or gel lanes were spliced inappropriately (Semkova et al, 2006), yet the journals Experimental Eye Research and FASEB J chose not to act either”. In fact, a corrigendum was published for the article from 2010 [I indeed overlooked this fresh corrigendum from May 2016, my article appeared just after on June 2nd. The note acknowledged and corrected the image duplications reported on PubPeer as authors’ mistake, -LS]. In regard to the article from 2006, “splicing” was determined by the Charité, which was not forbidden at that time in instructions for authors. Therefore no Corrigendum was published [this kind of irregular splicing is claimed to have been acceptable in 2006, image below,- LS]. “Lane splicing makes it difficult to trust the published data where the loading controls seem to belong to different gels than they are supposed to. Evidence for vertical and horizontal gel splicing as posted on PubPeer for Joussen’s publication in the journal where she acts as one of two EiCs. On this the dean of the University Düsseldorf found no “scientific misconduct” in his letter from 10.06.2016. The responsible employee of the Charité also checked the criticisms and decreed on 9.3.2015 [just five days after the evidence first appeared on PubPeer. The Charité told me on 31.3.2015 that they will not state their views on this or other 15 Joussen publications, see email screenshot below – LS] that the criticized excision of a band was described in the figure legend, hence not hidden from the reader. The accusations of PubPeer are therefore wrong. […] this was also not prohibited in the instructions for authors. ‘In autumn 2012, Springer received a hint that the publication Joussen AM, Kirchhof B., Periphere Netzhautdegenerationen—Behandlungsempfehlungen. Ophthalmologe 2004 Oct;101(10):1035-47, showed similarities with the publication Lewis, H., Peripheral retinal degenerations and the risk of retinal detachment. Am J Ophthalmol. 2003 July; 136 (1): 155-60 [link to paper here, -LS]. Even though the whistleblower has remained anonymous, editors and the publisher investigated the hint in accordance with the recommendations of the Committee on Publication Ethics (COPE) and decided together with the authors to withdraw the contribution because too large content overlap was found. Here, the text passages from the publication by Lewis et al. have been borrowed, but not figures or tables’”. In this regard the Berlin Charité has determined on 12.02.2013 that no plagiarism intention could be determined [again, see email by Bähr above –LS]. The retraction was made by senior author Kirchhof quickly and without waiting for results of university investigation because he saw this educational publication as scientifically irrelevant and chose not to quarrel in view of the raised intellectual property concerns. Also this is false. The publication appeared in 2001 (IOVS 42 2001 Joussen early diabetes […]. There were no band duplications. The Charité determined this. Moreover, S. Huang, who is later quoted against the author, is a co-author. Also her former boss Adamis was investigated, according to Joussen (double negative hers): “all papers with Dr. Adamis were investigated by Harvard, and such defamations can be lacking no basis”“. Dr. Adamis was never a target of investigations for “scientific misconduct” [yet apparently his papers were, according to Joussen, see email above -LS]. Your descriptions infringe upon personality rights of my client. The publication indexes a danger or repetition. You are to immediately delete the criticised publication. My client stated: “all papers with Dr. Adamis were investigated by Harvard, and such defamations can be lacking no basis” . You are to then delete the criticised publication. The deadline given to you is to be observed, otherwise I will implement court measures to ensure the interests of my client. In case the deadline expires fruitlessly, I will advise my client to involve court action. Further compensation demands are explicitly possible [according to above information Joussen intends to demand at least €80,000 in compensation from me, -LS]. This letter is sent to you exclusively as legal information. I forbid you every even indirect use of it for publishing in own right. Bound to happen, reach for a lawyer rather than admit to having done it wrong! When you get legal advice, it will be interesting to find out whether comment in public on a publication (which is in the public domain and placed there by the authors for scrutiny) can actually be silenced. Leonid, you must be proud – you’ve really stirred things up. I’m not a lawyer (and I haven’t studied the facts of the case), but this seems like an empty scare tactic. (The legal profession may be in as poor a condition as the medical). Interesting that PubPeer seems to be implicated in the whole situation. They seem, in effect, to be challenging the right of individuals to publicly reproduce or respond to anonymous PubPeer comments. Because, in principle, you could have posted ALL your articles first on PubPeer, anonymously, and then simply reported or commented on or drawn conclusions from them (which is partly what they’re saying you did.) So I think their legal claims are much bigger and more challenging than they may at first appear, (and probably much bigger then they have the skill or stomach for.) This aside from the fact that the claims of factual inaccuracies (if this is a crime) seem subject to debate. I recently read an article somewhere about the replication crisis in science, where the author said that the defenders of the status quo rarely actually defend anything, they just keep promoting fellow defenders and blocking/ignoring critics. I don’t think the people threatening you really want to have to try and defend their position. They just want to limit information to the official version, the way things used to be before the internet. This lawyer is not very bright: they cannot prohibit the publication of a letter they sent you. Also, even though your language is a bit tough at places, I checked the problematic sentences, and except the one related to were vs are under investigation at Harvard, the rest you correctly use “seem” “seemingly” “apparent”. It would be very difficult to even accuse yout of shedding false light: nobody can tell you what should be apparent or can seem to you because you are not bound to proving it beyond a reasonable doubt as we are not in a criminal court. However, I find this letter coercive, especially because of the lie that the Gmail account used is not hers: if they use it as argument and it is false, they are forcing to do something based on an illegitimate act, here lying, under fear of consequences, here 80,000 EUR, hence it is coercive. What makes it coercive is the apparence of professionalism by involving a lawyer who led you to believe that they know better. All in all, I think you have a case to complain against the lawyer to the DAV – German Bar Association which you are allowed to do without repercussions; such lawyers such not be allowed to thrive on 2000 EUR fees. Hi Andreea, thanks for your support. There was not question about whether Adamis is still investigated or already was (if he still was, he cannot be simultaneously already found innocent). They deny the existence of the email. In fact here is the entire email, officially signed by Joussen, despite her Gmail account. We need to prove that the email is really hers because the burden of proof lays on us if they say that it isn’t. The situation with gmail accounts is murky. But it is not impossible: We need to find another scientist, e.g., unhappy collaborator, with whom she exchanged emails from that account. If needed and when needed, we can divide work in contacting all her former collaborators/co-authors of her papers. Andreea, no need to prove anything. This is how I found Prof. Joussen’s official corresponding author googlemail address in the first place: http://www.ncbi.nlm.nih.gov/pubmed/19482023. The issue, also that of alleged harassment, should be settled now. Leonid, please do not despair!. You are doing the right thing and Herr Eisenberg is trying to defend the indefensible, therefore he has no chances to succeed. Please let us know what the scientific community can do to support you and we will stand by you unconditionally! Leonid, my words are exactly the same as Juan Jovel words. Once the evidence of Dr. Joussen misconduct becames overwhelming, she will quietly disappear and we won’t never ever hear again from her! well, Juan, I studied in Cologne and hold a PhD degree from Düsseldorf. I am so proud now, especially of the latter. However, I am still puzzled why Prof Joussen did not share this dean’s letter with me. And there is the 1.5 year investigation with its secret results in Cologne, which they will have to divulge if things get serious. This letter from http://www.eisenberg-koenig.de follows a blackmail pattern. It is quite strange to send a letter requesting cash and ask you to not show this letter to anyone. I hope the clients of Eisenberg and Co will see their “professionalism”. I personally would sue Eisenberg and Co for blackmailing. Dr Joussen had the choice of contacting you, calling your attention to disputed issues of fact, and asking you for a correction or the removal of your claims; or of paying a lawyer to take those same steps on her behalf. She chose the latter, but I can’t see the basis for expecting you to pay the lawyer’s €2000 fees. I imagine, though, you would prefer to hear from someone with experience in the German legal system. I wonder if Popehat’s network of pro-bono free-speech lawyers includes anyone near your. Thing is, all my facts are correct, except of one Erratum which appeared just before I published my blog. The evidence on PubPeer is public and not exempt from reporting on. The Charite refused to comment on the 16 publications Joussen’s lawyer sees as exonerated, as I evidence by the published email above. The Ombudsman of the University of Düsseldorf refused any communication (thus I could not even find out if any investigation is being performed there), the University of Cologne refused sharing the outcome of their 1.5 year-long investigation. Also Prof. Joussen did not share any documents at all in this regard in her lawyer’s letter. Oh yes, I agree that the facts are on your side. Indeed, Dr Joussen’s decision to work through a lawyer rather than contact you directly could be interpreted as a tacit acceptance on her part that the facts are on your side. I would like to advise you to sent a friendly response to Johannes Eisenberg in which you offer your sincere apologies to professor Joussen about your erroneous statement about a correction which was already published when you have posted your blog post. I think it is good to explain the details (the date when this correction was published and the date when you have published your blog post) and that is was an oversight from your side that you had missed the publication of this correction. I also would like to advise you to provide Johannes Eisenberg with the contact details of Pubpeer. I finally would like to advise you that you are of course always willing to correct your blog posts, but that you need the background information (= the reports from the various universities) to investigate if the corrections are founded. So ask Johannes Eisenberg for copies of these reports. Within The Netherlands, anonymized versions of the final version of these reports must always be published at the webside of VSNU ( http://vsnu.nl/overzicht-wetenschappelijke-integriteit.html ). You can suggest Johannes Eisenberg that this is an example of good scientific practise that such reports are public. You might also suggest him that you prefer a system like in The Netherlands and/or a system that the university in question always uploads (an anonymized version of) the final report at the university website. Note that it is of course not excluded that Johannes Eisenberg is in the possession of drafts of one or more of these reports of one or more of these universities and that it is therefore not allowed for him to sent you a copy. That’s also the case in The Netherlands. Dutch universities (and also VSNU) will never communicate about drafts. So you can write to Johannes Eisenberg that it is understandable that he is unable to sent you one or more of these reports because they are still drafts. Very strange to hire a lawyer, so much money for nothing. I suppose this is only empty threats. Move on with your excellent journalism. If you need money for a lawyer, I am sure we can crowdsource a significant amount. Totally agree, Leonid should move on with his excellent journalist, for sure are only empty threats! I was reading your blog for a while now, and I can’t help the impression are doing a good job for science here. Therefore, you have my full support! Why not write an explanantory letter to the “Anwaltskammer Berlin” and advise them of this alleged blackmail attempt by this “shyster” (Winkeladvokat)? Ist jemand der Meinung, dass die DFG Aufrichtigkeit verfechtet? software which permitted automatic reading of Multiplex DNA sequencing film. but stalled negotiations for a permanent license. for GTC while being employed by HHMI. commercial products promptly into use. industrially-sponsored research agreement raises a number of questions. likely to result from the research. license would create at least the perception of a conflict-of-interest. advised of the background and conditions of any such proposed arrangement. gave Harvard $22 with no-strings-attached. there is an honor it that, Harvard is not going to change its ways. walls of the den of thieves is a proper tribute to their life achievements? companies and the scientists connected to these companies. „[SAN DIEGO] The US Department of Veterans’ Affairs is conducting an inquiry into whether the absence of documentation on key experiments leading to the publication of research carried out at a centre affiliated to Harvard Medical School should be treated as scientific misconduct. Although internal investigations at Harvard last year led university officials to the conclusion that “it was not possible to ascertain whether the experiments had been done as described in the paper,” they also decided that absence of documentation did not constitute scientific misconduct. Officials of the veterans’ affairs department, which funded the research, are now conducting their own investigation and reviewing the Harvard inquiry. Meanwhile, another federal agency is investigating a claim by a researcher that she lost her job after she questioned the paper when it was being submitted for publication. The research concerns a genetic defect causing a Factor VII deficiency in an Italian patient. It was carried out under the direction of Kenneth A. Bauer, chief of haematology-oncology at the Veterans’ Affairs Medical Center at West Roxbury, Massachusetts. The disputed experiments were carried out by Arnaldo A. Arbini. a physician from the University of Milan who was doing research in Bauer’s laboratory, and published last June in the journal Blood. Arbini has since moved to Yale University. In a letter last October to the researcher who questioned the paper, Margaret L. Dale, an attorney in Harvard’s Office of Research Issues, admitted that “there was concern that a paper had been published reporting on experiments for which there were not extant primary data.” But Dale wrote that there was not sufficient evidence to conclude that there was scientific misconduct. Dale pointed out that the experiments “were repeated in September under the supervision of an independent observer. As a result of that process, it was determined that the paper could stand uncorrected.” Peter V. Tishler, a Harvard physician who is associate chief of staff for education at the veterans’ affairs department in West Roxbury, said he observed the repeating of the experiments. The issue of whether the absence of primary data notebooks constitutes scientific misconduct has varied over the years. In a case in the late 1980s involving a former biochemist from Baylor College of Medicine in Houston,Texas, who made use of research results from a paper he was reviewing, the National Institutes of Health (NIH) decided that the absence of primary data was an important factor in finding misconduct. But Christopher B. Pascal, acting director of the NIH’s Office of Research Integrity (ORI), says that recent decisions show “the mere absence of records alone isn’t sufficient proof of scientific misconduct.” Pascal says that NIH is concerned that an individual might use a lack of records as an excuse for “dumping records” to cover up the fabrication of data. “The problem is, you have to prove intent,” he says. The same point is made by Dinah K. Bodkin, the former researcher in Bauer’s laboratory who expressed concern about the Arbini paper. “Harvard has stood the definition of scientific misconduct on its head,” she says. Danielle Brian, executive director of the Project on Government Oversight in Washington, DC, which is assisting Bodkin calls Harvard’s conclusion about the lack of notebooks “patently absurd.” In seeking a thorough investigation by the veterans’ affairs department, Brian wrote that Harvard’s handling of the case “appears to fly in the face of overwhelming facts.” Don Gibbons, a spokesman for Harvard, says that the university thoroughly investigated the complaint before issuing its opinion last October. Ich meine, dass The Daily What The F. über Harvard Uni – ohne den Name dieser Uni – berichtet hat. Der Anwalt Johannes Eisenberg ist kein Naturwissenschaftler 🙂 Wilhelm (Billy) Joel hätte gesagt: „Despite the law, you cannot hide the truth.“. Using a lawyer to censor criticism is not inevitable. “Dr.” Tiago Fleming Outeiro had utilised none of a lawyer and a police force and a public-prosecution service when he moaned about criticism that I placed on a website of the Portuguese laboratory LIP (Laboratório de Instrumentação e Física Experimental de Partículas) at the Department of Putative Physics of the putative University of Coimbra. Instead of exposing himself to a counterclaim for malicious prosecution, he maliciously said false facts to LIP. Therefore LIP recommended to the Portuguese Foundation for Science and Technology to not pay me. “Nature”; Elizabeth Gibney; David Reay; Ivan Oransky; Retraction Watch; Neuroskeptic; Automattic; Jaime A. Teixeira da Silva; Emily Elizabeth Dory; Molly K. Lindsey; the “Journal of Law, Technology & Policy”; the University of Illinois at Urbana-Champaign et al. immorally, knowingly cover up related malconduct. Persons of LIP who were involved with dishonourably covering up on behalf of “Dr.” Tiago Fleming Outeiro include: Rui Ferreira Marques; Rui Miguel Curado da Silva; João Silva (a pity to claim this as he is always polite to me, even after I was locked out); Jorge Gomes; Mário João Martins Pimenta; Paulo Jorge Ribeiro da Fonte; and Carlos Manuel. Of course it is legal to silence public comment on a publication. Edgardo Sepulveda: “Oh man, I hope you have legal insurance”. If he would be too poor to pay for legal representation and if he would not have access to legal representation via e.g. a union or insurance, then he would probably be eligible for legal aid (“Antrag auf Bewilligung von Beratungshilfe” “JV 200 Schriftlicher Antrag auf Gewährung von Beratungshilfe (02.14)” – JV_200__2.14__Formular.pdf – and “Erklärung über die persönlichen und wirtschaftlichen Verhältnisse bei Prozess- oder Verfahrenskostenhilfe” “JV 205 (2) Erklärung über die persönlichen und wirtschaftlichen Verhältnisse bei Prozess- oder Verfahrenskostenhilfe (2.14)” – JV_205__2___2.14__Formular.pdf ). Why dost thou believe that false light is not a crime in Germany? [. . .] Herr Eisenberg is trying to defend the indefensible, therefore he has no chances to succeed. Sie spinnen leider. Viele Entscheidungen sind natürlich unfair. During 2013 I had been subjected to aggravated assaults because of Professrix Maria Filomena de Osório Pinto dos Santos Figueiredo. During August 2014 Leonid Schneider has published (probably originally unintentionally) malicious falsehood against me on Retraction Watch. Shortly afterwards, also during August 2014, I have provided Leonid Schneider with background evidence but alas by July 2016 he did not correct any blog post about me.